Chrysler 'Powered By' Wheel Sticker. 3.5". Chrysler Black & Brushed Foil Wheel Centre Stickers. 50mm. Set of 4. 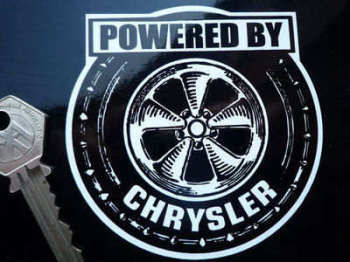 Chrysler Black & Silver Circular Rosette Logo Stickers. 63mm Pair. Chrysler Coloured Rosette Shaped Logo Stickers. 2" Pair. Chrysler Coloured Wheel Centre Style Stickers. Set of 4. 50mm or 54mm. Chrysler Corporation Mopar Service Sticker. 3.5". Chrysler Gold Circular Logo Stickers. 3" or 4" Pair. 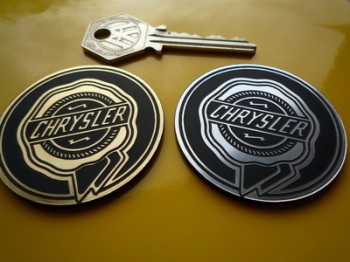 Chrysler Gold Rosette Shaped Logo Stickers. 2.5" Pair. Chrysler Logo & Text, Cut to Shape Sticker. 6" x 7.5". Chrysler Logo Static Cling Stickers. 2" Pair. 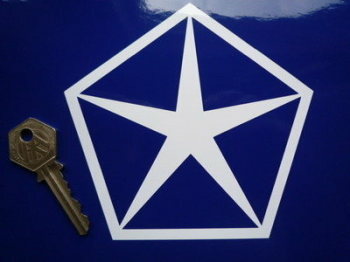 Chrysler Logo Stickers. 4" Pair. Chrysler Logo, White Cut Vinyl Sticker. 5". Chrysler Monotone Wheel Centre Stickers. 50mm. Set of 4. Chrysler Oval Stars & Stripes Fade To Black Sticker. 3", 4", 6" or 8". Chrysler Parking Only. London Street Sign Style Sticker. 3", 6" or 12". Chrysler Parts Chequered Flag Sticker. 5". Chrysler Rosette Self Adhesive Car Badge. 2". 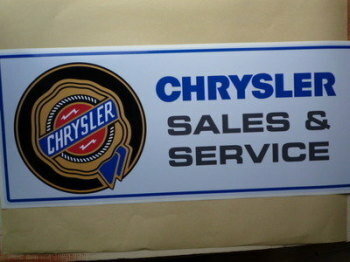 Chrysler Sales & Service Workshop Sticker. 23.5". Chrysler United Kingdom Competitions Centre Sticker. 5.5". 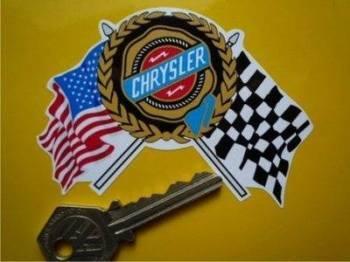 Chrysler USA Flag & Scroll Sticker. 3.5". Chrysler Winged Logo Stickers. 8" Pair. 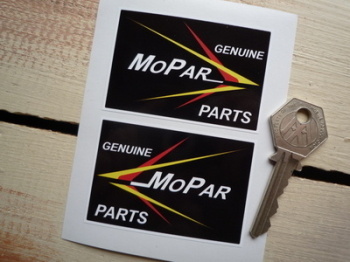 Mopar Genuine Parts Chrysler Stickers. 2.75" Pair. 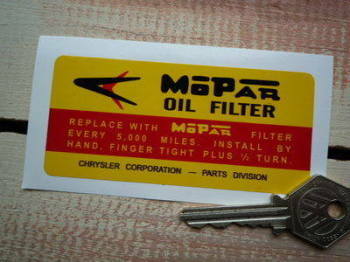 Mopar Oil Filter Chrysler Sticker. 4". 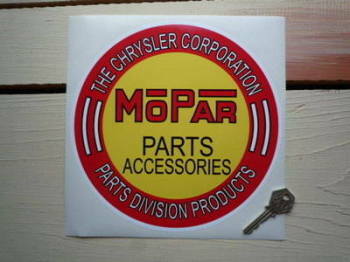 Mopar Parts & Accessories Chrysler Sticker. 8.5". 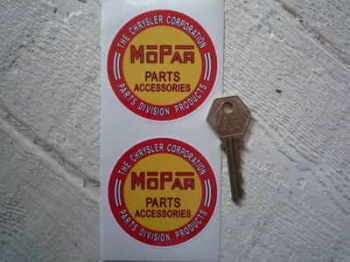 Mopar Parts & Accessories Chrysler Stickers. 2.25" or 2.75" Pair. Mopar Performance Oil Catch Can Grey & Silver Chrysler Stickers. 2.25" Pair. Mopar Performance Oil Catch Can Red & Black Chrysler Stickers. 2.25" Pair. 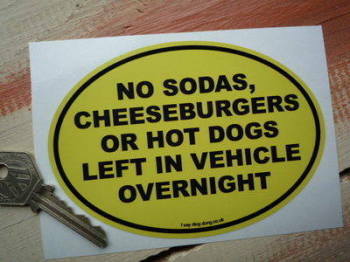 No Hot Dogs Funny American Van/Car Sticker. 5". Woody Laser Cut Self Adhesive Car Badge. 3.75" or 5.5".